A Hot and Dry Desert is, as you can tell from the name, hot and dry. Most Hot and Dry Deserts don’t have very many plants. They do have some low down plants though. The only animals they have that can survive have the ability to burrow under ground. This is because they would not be able to live in the hot sun and heat. They only come out in the night when it is a little cooler. A cold desert is a desert that has snow in the winter instead of just dropping a few degrees in temperature like they would in a Hot and Dry Desert. It never gets warm enough for plants to grow. Just maybe a few grasses and mosses. The animals in Cold Deserts also have to burrow but in this case to keep warm, not cool. That is why you might find some of the same animals here as you would in the Hot and Dry Deserts. 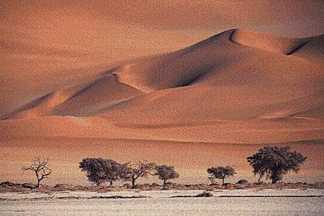 Deserts cover about one fifth of the Earth’s land surface. Most Hot and Dry Deserts are near the Tropic of Cancer or the Tropic of Capricorn. Cold Deserts are near the Arctic part of the world. The precipitation in Hot and Dry Deserts and the precipitation in Cold Deserts is different. Hot and Dry Deserts usually have very little rainfall and/or concentrated rainfall in short periods between long rainless periods. This averages out to under 15 cm a year. Cold Deserts usually have lots of snow. They also have rain around spring. This averages out to 15 – 26 cm a year. Hot and Dry Deserts are warm throughout the fall and spring seasons and very hot during the summer. the winters usually have very little if any rainfall. Cold Deserts have quite a bit of snow during winter. The summer and the beginning of the spring are barely warm enough for a few lichens, grasses and mosses to grow. Hot and Dry Deserts vegetation is very rare. Plants are almost all ground-hugging shrubs and short woody trees. All of the leaves are replete (packed with nutrients). Some examples of these kinds of plant are Turpentine Bush, Prickly Pears, and Brittle Bush. For all of these plants to survive they have to have adaptations. Some of the adaptations in this case are the ability to store water for long periods of time and the ability to stand the hot weather. Cold Desert’s plants are scattered. In areas with little shade,about 10 percent of the ground is covered with plants. In some areas of sagebrush it reaches 85 percent. The height of scrub varies from 15 cm to 122 cm. All plants are either deciduous and more or less contain spiny leaves. Hot and Dry Deserts animals include small nocturnal (only active at night) carnivores. There are also insects, arachnids, reptiles, and birds. Some examples of these animals are Borrowers, Mourning Wheatears, and Horned Vipers. Cold Deserts have animals like Antelope, Ground Squirrels, Jack Rabbits, and Kangaroo Rats. Thanks sooo much for the info… it really helped me with my project! I just finished my project too.. awasome.. thanx 4 da website.